My dad, as faithful readers know, turned 90 this June. He wears his hair in a pony tail, loves red wine, good cigars and Dixie Land Jazz. He treats himself to several 24/7 days of that music each spring when he goes to New Orleans for the jazz Festival. Often, on a Saturday, he takes the train to Toronto to hear some music. You can find him at the Rex on Queen, the C'est What on Front or Grossman's on Spadina, listening to his favourite bands. 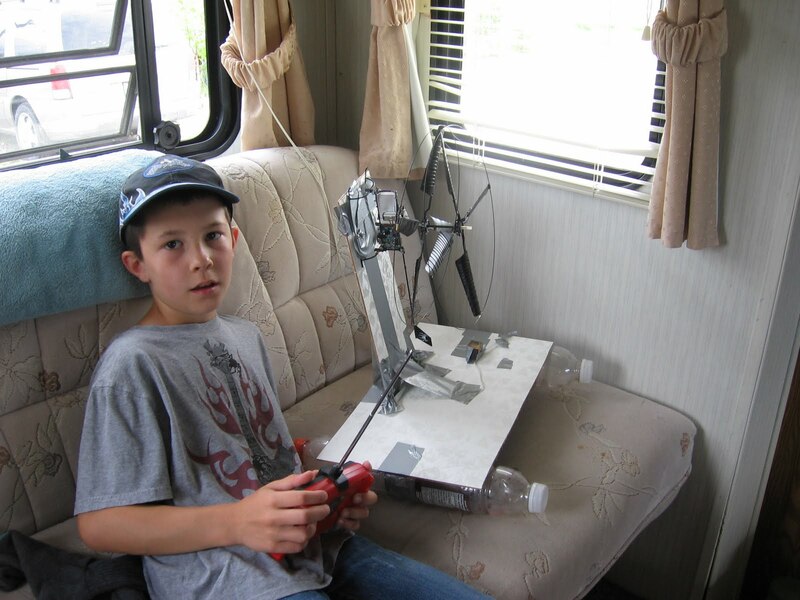 Last week while here at the trailer, son Charlie, at work in Hearst, received an email from 'Grandpa Jack' that said to tell me to read this article http://www.tillsonburgnews.com/ArticleDisplay.aspx?e=2682470 from the local newpaper. Way to go, Dad! While your family might be quite active, we'll never beat the hours you've spent at the gym. That slow loss is a great goal, though. It was just one of three summer garments I intended to make in the summer of 2010. Intended, but really thought I would be lucky to get even one knit. Past experience has taught me that I suffer from 'my eyes are bigger than my stomach' syndrome when it comes to actually getting the knitting done. But this year, my needles are flying. Even with the extra sock knitting I've done. 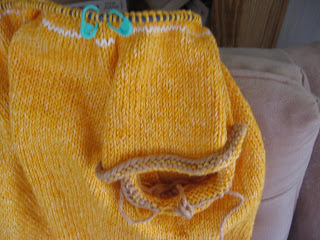 I made the vest, then the 'Eyelet Cardigan' and now - look how far along I am with the yellow sweater. Not knowing for sure if I have enough yarn, I started the sleeves with waste yarn. Once the body is complete, I'll divide the remaining yarn in half and knit each sleeve until I run out of yarn. I only want short sleeves anyway, so hopefully will have enough. The style is an EZ raglan. Based on a swatch-free guess that I would knit to the exact ball band gauge of 22 sts/4", I cast on 200 stitches. Increasing 4 stitches - 2 at each side seam - every two inches, I ended up with 220 stitches. 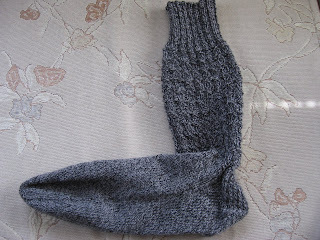 I knit for 11 1/2 inches to the armhole then put 8% of stitches on hold for the underarms. That's what Elizabeth said to do. I'm in the last half of the upper body right now and am incorporating a few white rows here and there to help the yellow last through the sleeves. 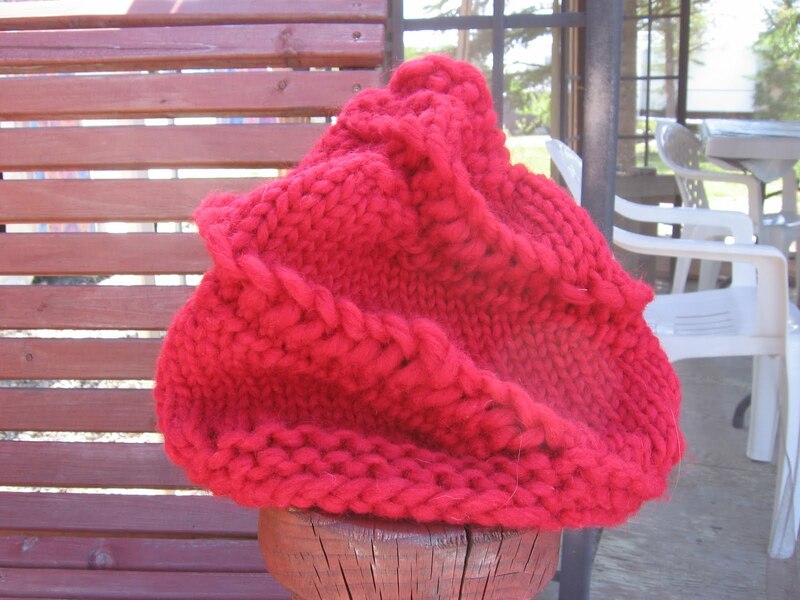 It will be a nice addition to my summer wardrobe and the last summer knit of 2010. Then back to the good stuff. Wool. Yes, indeed! Elizabeth's back. Taking a brief EZ break from the small needles and fine yarn of socks, I decided to make the Snail Hat. 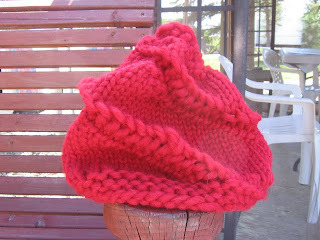 It's a hat I have never previously made but one that's been on my EZ list of 2010. 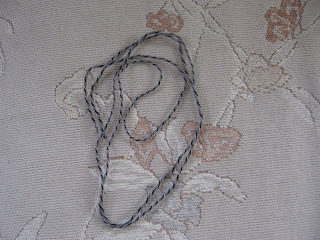 Mine is made with a cake of Briggs & Little 5 strand unspun - commonly used for thrumming or Cowichan-like sweaters. 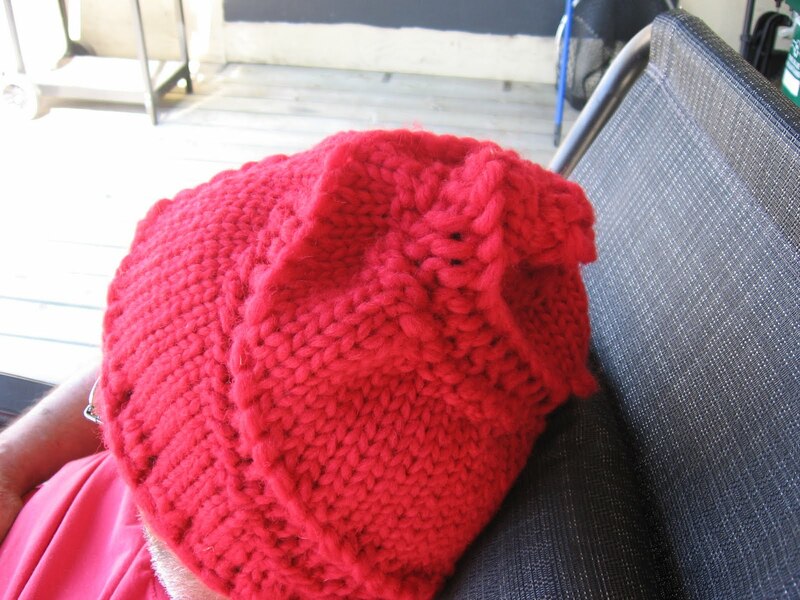 It is thick - about 2 stitches to the inch with 7.5 mm needles - and soft. Perfect for this hat. The hat is a quick knit. It doesn't take long to figure out the math Elizabeth used and how to make those purl strips spiral towards the top. But is it a hat that I would wear?? Not so sure. A hat that I will even keep? Not so sure. 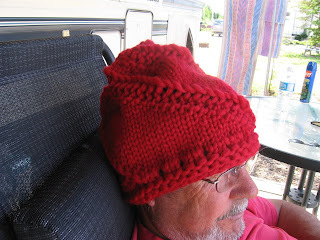 Does it look as good on me as it does modeled in The Opinionated Knitter? Definitely not. Sorry to say. Then the arm of the 'balanceur' - porch swing in English. The math works. The pattern works. The yarn works. But style??? Lacking a little something, I think. Is Brenda still on vacation? Is Brenda enjoying her grand kids? Is Brenda knitting at all? In the car, I knit a man's size thick sock. I chose red - real men wear red, right? Again picture less. But imagine a great, ribbed, thick, warm, cozy sock. 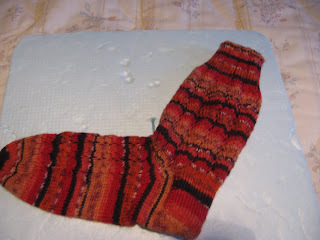 Then came another man's size sock - with Waffle Stitch pattern on the leg. At last I remembered the picture part of the process. This is how much yarn was left. Phew! 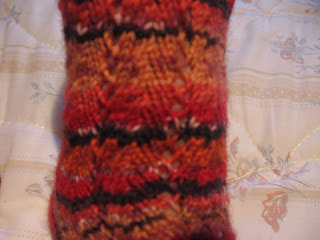 Then a ladies, lace sock. I love!! this sock. I love the colours and I love the simple lace-ness of it. Definitely socked in. But great fun. It matters not the medium. For me it's yarn. For others - well - materials vary. Take a look. James created a boat - a catamaran of sorts. 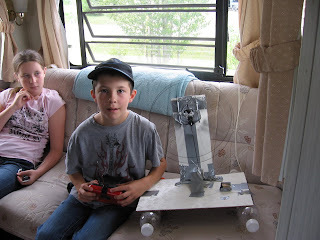 He created it by taking apart his Spider Man helicopter and using it to power the boat. Two large circles of blades sit at the top of the boat. Pop bottles float it and it's held together by - what else - Duct Tape!! Not yarn, not knitting, but great creative juices. I personally want to give thanks to the inventor of those little DVD players that kids use in vehicles. Our 11 drive to Hearst with 3 kids in the car was amazingly quiet and absent of any kiddy complaints. The drive gave me enough time to knit one entire man-size sock of Briggs & Little Tuffy -the yarn James wound for me the day before we left. Mind you, knitting at 7 am in the back seat of the van feels a bit funny - not my norm at least. Yes, I did say back seat. One of the 3 kids suffers from car sickness and I'd rather sit in the back than have a sick child. So the 13 year old gets the front seat and looks after Grandpa while he drives, and Grandma sits - what seems like miles away- in the rear. Knitting. Not a bad situation at all. At the moment, I have come to 'town' to use the computer. While I have figured out the basics of this different machine, you will notice this is a pictureles post. I need - probably - a child to show me how to post pictures. Until then, thanks for reading. It's hard to beat this scenario. The last ball of yarn to be wound for vacation knitting. Carrying Grandma's yarn to the car. Then the box of books. 9 year old boys are the greatest. We are off for our long drive. Dressed in our best to ensure good, gas station service. 11 hours should be enough for Grandma to knit a pair of men's red socks. Baby Socks. So cute. One evening each - that is all the knitting time I've managed to stay awake for. Tomorrow we're off to Hearst where there is no computer. Posting will be limited to the times I can steal minutes on my son's computer. Have a great summer and thanks for reading.